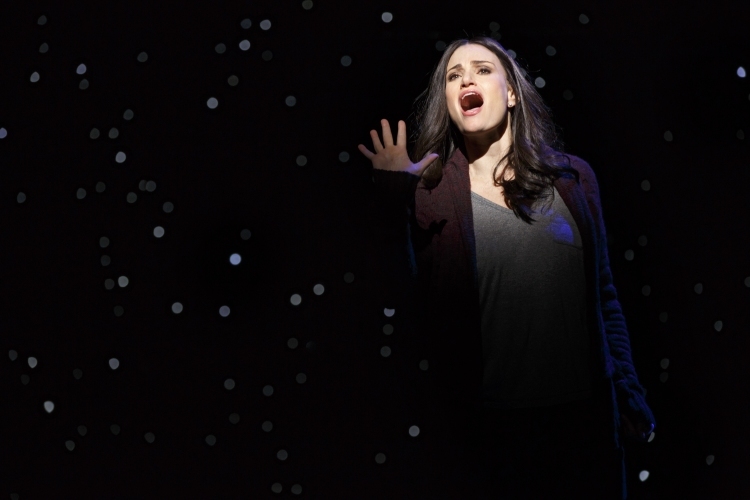 Seldom seen in this time of corporate-driven, franchise-ready productions, the star vehicle makes a well-deserved return for Idina Menzel, worshipped and idolized star of music theatre stage, concert hall stage, small screen, big screen and animated screen. The second rarer-than-rare factor at play is the creation of a new musical completely from scratch. Ina season when the Broadway show list reads more like a cinema multiplex listing, this is a welcome and admirable achievement. What a thrill and honour it must be to have a Broadway social written and produced to suit your unique and special gifts and talents. There is a moment written in to allow time for our wild reaction when Menzel first steps on stage, and another for the overwhelming reaction after finally hearing her trademark belt in full flight in 11 o’clock number “Always Starting Over.” The role of Elizabeth includes the high notes, head voice, emotional intensity and self deprecating humour at which Menzel excels, and she is certainly in top form, giving her all to her performance and to the show. Whilst it would have been understandable if producers had toyed with the idea of skimping with the rest of the cast surrounding their megastar main attraction, thankfully this is not the end result here. 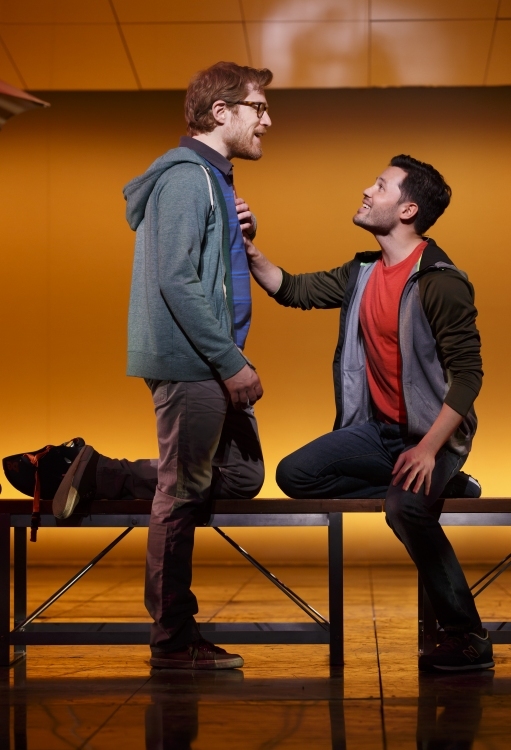 Menzel’s fellow original Rent castmate Anthony Rapp joins her as activist, and old friend, Lucas. The luminous LaChanze (The Colour Purple) is impassioned kindergarten teacher Kate. James Snyder (Cry-Baby) is returned serviceman Josh. Jenn Colella is Kate’s flirty partner, Anne, and Jason Tam (A Chorus Line) is Lucas’ bright-eyed boyfriend David. Menzel and Rapp also reunite with Rent director Michael Greif, who shows a sure hand, both in guiding the constant flow of action and in keeping the parallel story threads clear and distinct. 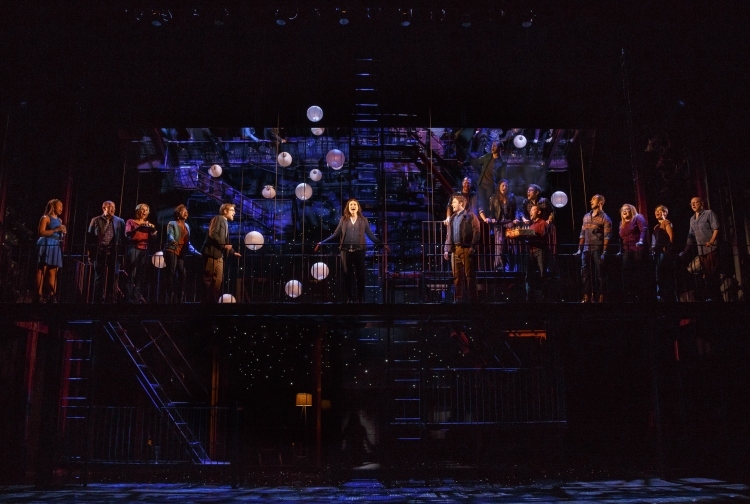 Writers Tom Kitt (music) and Brian Yorkey (book an lyrics) have followed up their revered musical Next to Normal with this concept musical, set in New York in the present day. While all the self-analysis, self-doubt and self-realisation have a very American edge to them, the writers have captured many elements of the zeitgeist, with frequent aspects and incidents being highly recognizable. The music is immediately accessible, if not entirely memorable. The cast recording will definitely be worth hearing. The Sliding Doors concept works clearly enough with the twin strands of “Liz” and “Beth” distinguished simply by eye glasses and colour codes from Kenneth Posner’s pretty lighting design. (It must be noted that 2002 British musical Our House already used this idea to brilliant effect.) Mark Wendland’s high concept set is a bit of a star in its own right, featuring gliding modular frames that adapt to a multitude of settings, a series of overhead walkways and oh-so-NY fire escapes, and a giant overhead mirror that lifts and tilts throughout. The theme of duality is explored with the use of mirrors and a revolve, with further moments in the script also indicating the never ending flow decisions and choices we face every day. All of the cast are in fine voice, but special mention goes to Snyder, whose fine Broadway tenor is a pleasure to hear. He lands the gorgeous act two ballad “Hey Kid” as Josh takes on shades of Billy Bigelow in imagining his unborn child. 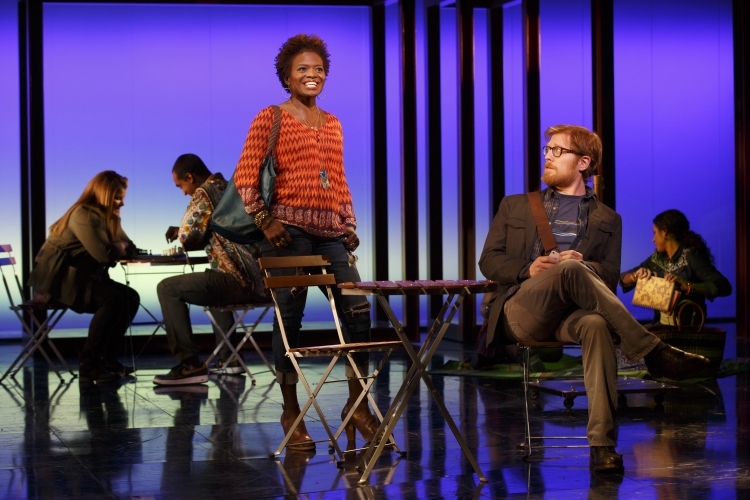 It will be interesting to see how If/Then travels beyond New York and beyond Menzel’s involvement. Meanwhile, her performance is not to be missed. 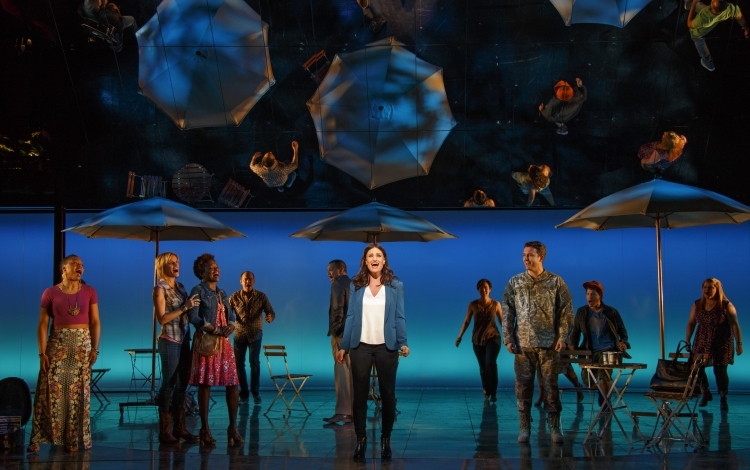 If/Then was reviewed 2pm 12 April 2014 at Richard Rodgers Theatre, New York, where it has an open-ended run. Jealous that you saw Idina in both of those legendary stage outings! 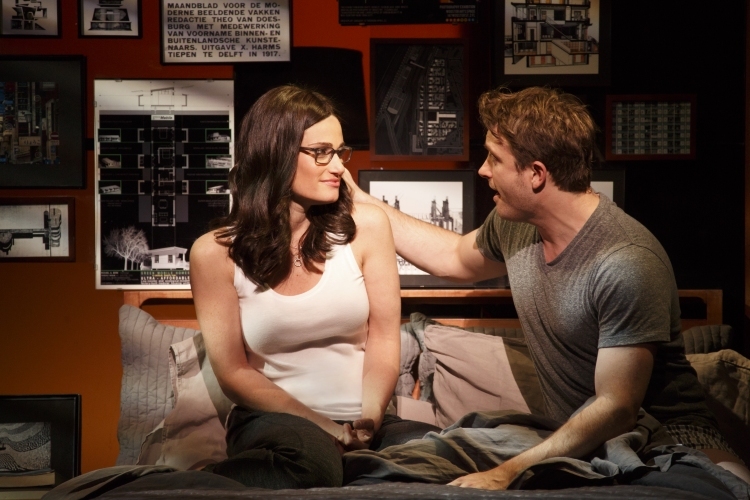 I don’t think this show is a good/memorable as Next to Normal overall, but definitely worth seeing for Idina! So glad you’re reviewing Adele Dazeem in her new show. What a star. It seems only yesterday when Ms Menzel previewed “Learn to Live Without” at her one-woman show for her adoring fans last year in Melbourne. Looking forward to the cast recording when it is released. Thanks again for another fantastic review. Haha yep that Adele Dazeem is more famous that ever right about now. Of course! I totally forgotten that she sang a song from the show in her concert last year. Should have mentioned that in my review! Glad that you are on the ball. I think the cast recording for this will be wonderful, and I look forward to having proper, repeated listens to it all. Meanwhile, I just read that the cast sang “Seasons of Love” at last night’s performance. Wy did I go to the matinee???!! !